1. 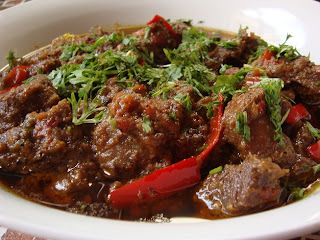 Marinate the lamb with oil, garlic, ginger, green chillies and salt for about two hours. 2. Sauté onions, cinnamon, cardamom, cloves and cumin seeds in ghee until brown. 3. Stir in chillie powder, crushed chillies, coriander seeds and turmeric and braise for 1 minute. 4. Add meat and braise well, lower the heat and cook till the meat is tender. 5. stir in tomatoes and tomato paste/puree. Simmer for about 10 minutes.